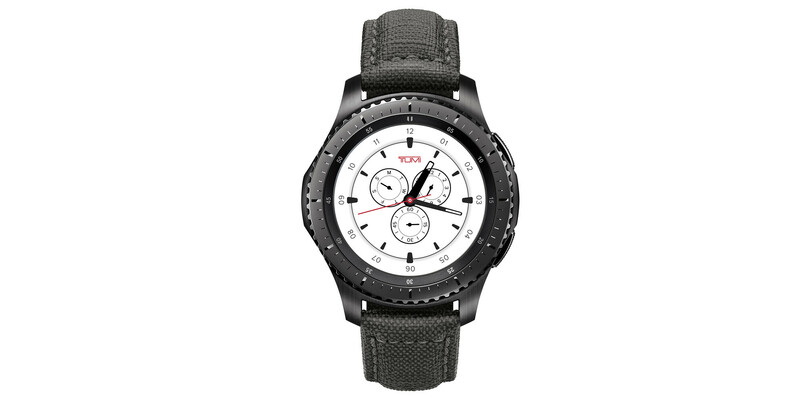 Samsung and Tumi, a US-based company that manufactures suitcases and bags for travel, have just announced they have teamed up to offer consumers who wish to stand out, a luxury version of the Gear S3 frontier smartwatch. Starting today, the new Samsung Gear S3 frontier TUMI Special Edition is available for purchase for $449.99 via Best Buy and Samsung. The wearable can only be bought online, but coming August 6, it will go on sale in stores for the same price. Unlike the regular model, the special edition comes with a watchband designed by TUMI featuring the Early Grey color signature. The watchband is made of Italian canvas (leather would have been more expensive) and features a stainless-steel buckle along with stitched edge detailing. According to Samsung, the watchband is durable enough to resist water, dust, or rough conditions. Furthermore, the luxury smartwatch comes with a custom TUMI watchface. As far as specs go, Samsung Gear S3 frontier TUMI Special Edition is similar in every way with the regular version. As such, the smartwatch sports a 1.3-inch Super AMOLED display with 360 x 360 pixels resolution and Corning Gorilla Glass SR+ coating. Also, it packs a 1GHz dual-core processor, 768MB RAM, and 4GB internal memory. The Bluetooth-only Samsung Gear S3 frontier TUMI Special Edition includes many other features like GPS, NFC (Near Field Communications), wireless charging, IP68 certification, as well as speaker and mic. It's compatible with both Android and iOS smartphones running Android 4.4 or later and iOS 9.0 or above, respectively. I'm good with my LTE Frontier, best smart watch yet for me. I love that. I've only done it twice by mistake, but having a fully functional phone on your wrist is dope. Quite pricey, but TUMI is about luxury stuff. Gear S3 Frontier is good enough for me. I am hoping that there is a Gear S4 variant that is the same size as the Gear S2 classic. I don't think there will be and might have to settle for a Gear S2 platinum but fingers crossed.